NEW $100,000 GUARANTEED Jungle Roar! Ready to play on the wild side? 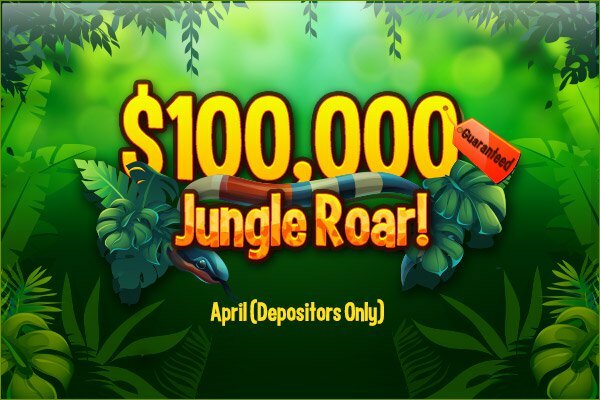 Come interact with the jungle animal-themed games in the Main Room as we play for prizes of up to $1,000 in GUARANTEED CASH JACKPOTS, April 5th through April 30th. You’ll start your adventure by playing the NEW $1,000-$150, $500-$100, $250-$75, $100-$25 jungle-themed games while having fun, waiting for that WILD JACKPOT WIN. Every hour we will randomly play two or more of our wildly safari bingo games and on May 2nd we will raffle off $1,000 in EXTRA PRIZES among all bingo winners. Why not take a swing through a bingo jungle? The wild jackpots are waiting. Ain’t no "Lion" about it, you’ll have a roaring good time! Hint: There will be jaw-dropping bonuses all month long! Visit our Facebook page to stay updated! This entry was posted in Blog on Apr 18, 2018 by Canadian Dollar Bingo.